The Nightcruiser Booking Crew in Collie has put together a number of 2-way Concerts – Festival – Event Transport packages. Now you will not need to miss out on Concerts or Festival in the Perth Metro area or the South West and you’ll find they are more economical than you think. So get your group together and organise your tickets and enjoy a great concert excursion. We cover a wide pick up area in the South West with many different seating vehicles and all with music onboard. The Nightcruiser Crew have listed many options for Transport in a party atmosphere. Plug in your electric device and enjoy your own selections of entertainment while you travel with your Guests. The Nightcruiser developed the group transport many years ago when we convinced Promoters to put on a transport to outdoor concerts. Also, it became a great service for “don’t drink and drive” options where it’s not necessary for someone to be a skipper and miss out. That your concert on the way to the concert. Invite all your guests for Bus or Coach Hire Perth with the famous Nightcruisers. We have 21, 25, 30, 35, 45 and 70 seaters and cover the South West to Two Rocks including Northam and York to take you and your guests to any concert. Bring your own music for our power systems and subwoofer sound with disco party lights +TV Monitor. Add the Perth Wheel experience for extra fundraising on your tour. The Nightcruisers have been transporting groups to sporting events in a party atmosphere for some time. ‘Mad Monday’ is a term commonly used in Australia to refer to the traditional end-of-season celebrations for players of various codes of football. Football matches are typically played on weekends so as the season nears its end with teams being eliminated, by Sunday night all results have been determined and teams will then know if they are to continue in the play-offs or if their season is over. With the season finished, Mad Monday celebrations ensue, often involving heavy partying. The new Perth Stadium and Sports Precinct will be a 60,000 seat multi-purpose venue with a “fan first” approach to planning and design. The new Stadium is due to open for the 2018 AFL season. It will be capable of hosting AFL, rugby, football [soccer], cricket and big entertainment events. Public Transport and the Nightcruisers will assist with transporting capacity crowds. Nightcruisers will cover Two Rocks to Mandurah in various sized vehicles. 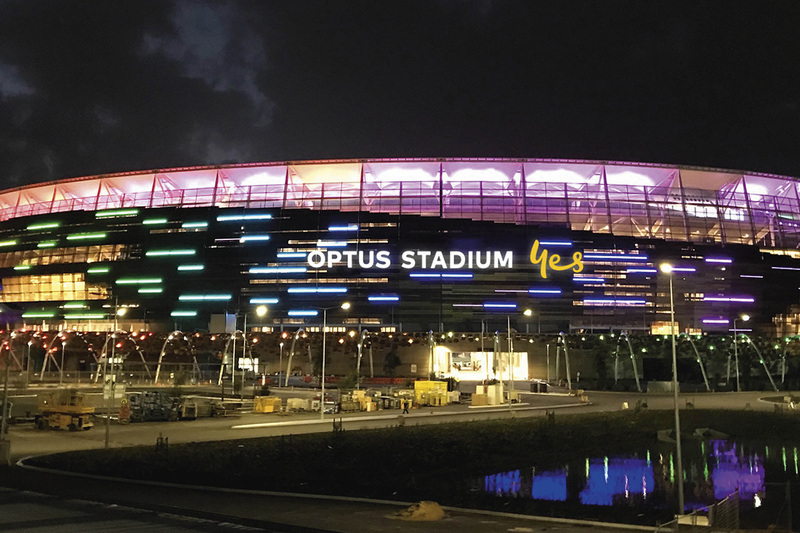 The new Perth Stadium will be a world-class five-tiered stadium with roof coverage over 85 per cent of its seats, a striking bronze facade that reflects Western Australia’s unique geology, LED lights that show home sports team colours, and a wide range of ‘fans first’ facilities including two of the largest video screens in the country. The Nightcruiser Footie Party Buses have taken fanatic football team supporters to events for sometime. The atmosphere on board is electric and in party mode all the way with the camaraderie spirit second to non. With the team song being piped through the sub woofers every one is primed by arrival to support their team. Bring your own music via iPhone, iPad etc. We cover Mandurah to Two Rock and all suburbs between. Get a supporting team group together and negotiate with your local Pub to assist with your affordable transport costs to get a Nightcruiser Footy Party Bus to take you to the game and return. You would all meet at the Pub for a few and a yarn prior to departure and make it a regular event. They might even allow you to decorate the place in your team colours. Upon return from the game, more drinks and a meal, it’ll be party time to celebrate with special incentives from Management. The Nightcruisers have been supplying transport to groups going to and from the Races in the Metro and County areas for some time. We have 21, 30, 45 and 70 seaters and cover Mandurah to Two Rocks.